Kazan Clark: Starving Artistamps Blog Hop! 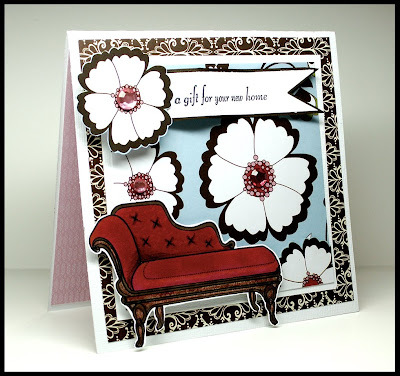 Welcome to the Starving Artistamps New Release Blog Hop. I am excited to share with you the newest DoodleFactory release Classic Decor. The entire Starving Artistamps Design Team and a few lucky others (wink) all created projects using the new line. Be sure to visit all the stops on the hop because one of the Designers participating in the Hop will give away a complete collection of new Classic Deco release as blog candy! (could be me...). Tracey has made some pretty impressive cards with the new Classic Deco Stamps - Enjoy! for the next 3 days Starving Artistamps are offering a blog hop special. Amazing cards! I just love your bold style - and the stitching on the chaise is an awesome detail! WOW! these cards are STRIKING! The COLORS are WONDERFUL. Kazan you are just amazing. I absolutely LOVE what you have done with these. Thank you so much for joining us. You guys are just so awesome! I love the way your cards stand out! Vibrant. Wonderful cards, Kazan! I really love your style. TFS! Beautiful cards! Love the bold colors! That chaise looks like real velvet and wood! Amazing coloring! Oh wow! I love the rich colors you used. Amazing cards. Love the details! wow! your cards perfectly showcase the new stamps! Oy vey, lovin' that Classic Decor set!!! What great pairings with those oversized flowers. Simple elegance at its best. What fun! Thanks for being part of the cool blog hop. I love seeing all of the talent and inspiration from everyone. Love your style and take on their images!! It's so bold and clean, and the colors are wonderful. I don't think I took a breath the whole time I was looking. Love the big flowers! Beautiful work! awesome cards Kazan! love how you used the stamps on these amazing looking cards! I love them! Love the colors and bold patterns!! What fabby cards. Love your dp. Beautiful cards! The colors are so eye-catching. You have a very distinct style! excellent work! Gorgeous cards! I love how you've combined the big florals with the images. Great details, too! Fabulous!! Love the way you used the bold flowers. I have found some great ideas on the hop. So many ideas I could not say what my favorite is. Beautiful cards! 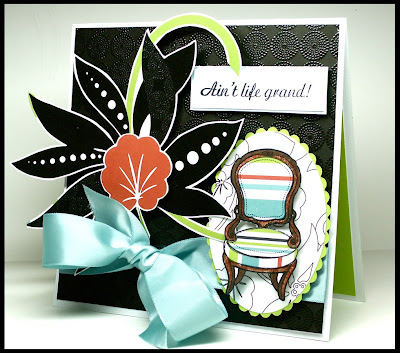 The Orchid paper is stunning with the chair in that second card! Love the big flowers on both of your lovely cards! I am so inspired by your work! I would love to be on a design team, but after looking at all these beautiful cards I have a lot to learn. You are so very talented!! Hi Kazan!! It's always so fun to browse through your blog :) I just love your elegant and fun style. Lovely projects and cards!! Wow, such an unexpected use of the home decor stamps, very modern and eye catching! Luscious cards! I love the rich colors!! LOVE the bright bold patterns on these Kazan!! You can definitely tell your passion is art. Your cards just shout how much fun you have creating. Wow, Kazan, I am loving your SA blog hop cards! I was wondering how I would use those stamps in my head and you've given me some great ideas. What an out of the box thinker you are!! FABULOUS! these cards are AMAZING, I absolutely love everything about them. milk until what supplements increase sperm count they are about six months time. yogurt all have high calcium content and high estrogen content.